I love asparagus. And I especially love it when it’s on sale for $.99/lb. Because then I’ll actually buy it! The boys love it too. My trick: Cut off the top “flowery” part and then cut into inch or so strips and it looks like green beans. With a slightly different taste, of course. I think with kids…half the “food battle” is that if something “looks funny,” then they are completely turned off without taking a bite…they’ve made the decision that they don’t like it before they even try it…so if you make it look like something else they like, then they won’t be turned off right away. Anyone else noticed that? Parmesan cheese (optional) We leave this out to stay dairy-free, but I imagine it gives a fabulous flavor to the asparagus! Wash, pat dry and snap the ends off the asparagus. 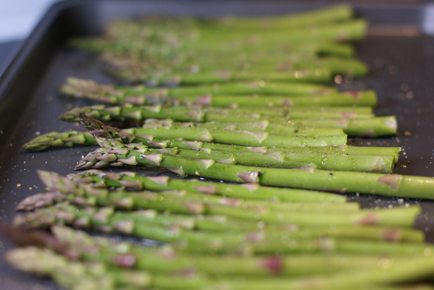 Place the asparagus in a single layer on a baking sheet. 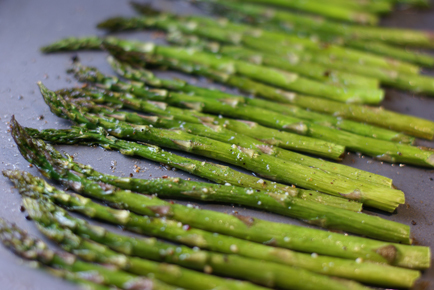 Drizzle the olive oil over the asparagus spears. Sprinkle with garlic powder, salt and pepper. Parmesan too, if you like. Roast in a 400 degree oven for 8-10 minutes, or until tender. Remove and serve immediately. I never thought to add garlic powder, yum. Thanks! I have some asparagus in my fridge that needs to be used up asap! This is my favorite way to prepare asparagus. Haven’t tried it with Parmesan before. I’ll have to add that next time. Thanks for the idea! Roasted asparagus is so good! We like to squeeze a little lemon juice over them after they’ve been roasted. Very smart about the “green beans”! I use olive oil, lemon juice and dill. Awesome! LOVE the dill idea! I’ll have to try that!!! I do this too. It is my favorite way to cook it. We put parmesan on ours. It is very good. Goes well with the asparagus. Too bad I’m the only one that really likes it! Try olive oil with sprinkling of salt, pepper and sugar. Where can I find Asparagus for .99 / lb.? Kroger in Ohio…every now and then! Mmmmmm – I love oven roasted asparagus!!! I make it this way probably once a week, and we have to cut the tips off for the kids, too. Whatever! A little cheat I use is that I use garlic salt instead of garlic powder, salt, and pepper. Two less shakes! It is good with the parmesan cheese, but I only tend to bother with that when company’s coming! My 4 year old loves the flowery tops, my 7 year old…not so much. Must try the grean bean trick when I make this this week. Hope out kroger has the same deal! My kids are definately like that when it comes to food too. My 7 year old is like that with the names of food though too. She won’t eat cauliflower, but loves white broccoli. Loves my tuna dishes, but is grossed out by my moms because “can you believe grandma eats tunaFISH! ?” And both girls will tell you spinach makes them gag……but extra ‘basil’ on the pizza or in the spaghetti sauce is yummy. It’s all in the presentation! Really good sprinkled with dried rosemary,too! This is our FAVORITE veggie! We also do this on the grill or the fastest/most economical way is to prepare the same way with olive oil, etc and stirfry it. My 8yr old son saw the pic of asparagus and wanted me to add that it is his favorite thing! He just finished eating the few left over from dinner. However, I think he ate them because he was trying to push off doing the dishes! Kids are sneaky like that! I do the same thing, but I sprinkle equal parts garlic and powdered ginger, and about 1/2 tsp sugar over the asparagus. Amazing! I bought asparagus on sale last Spring and wasted it because I didn’t know how to cook it. Your recipe gives me the confidence to buy it again… and cook it this time! Yes, we like it oven roasted or barbecued. The flavor is much better than steamed or boiled. We like to put a little mustard vinaigrette on them after they come out of the oven. We did ours tonight with a bit of orange juice, olive oil and thyme. They were devoured in record time! Last week I bought asparagus and did n’t have room in my fridge. So I cut off the ends, like flowers and put them in a mug with water in the window. They stayed fresh and tasted even better then before. I had them sitting in the water for 5 days. The kids loved it too. I would have like to roast them like this, instead of steaming them. I used the same ingredients, but sauteed the asparagus in a frying pan for about 10 minutes. Sprinkled kosher salt over the top (no Parmesan). No need to heat up the kitchen (if summer ever arrives…).